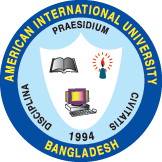 The students are encouraged to complete their pre-registration online (www.aiub.edu) from outside (home, cyber café, etc.). Revising pre registration with the new class routine. Applicable only for the affected students. following venues will be allocated for on campus registration.